First, get some Marine Tex in white. 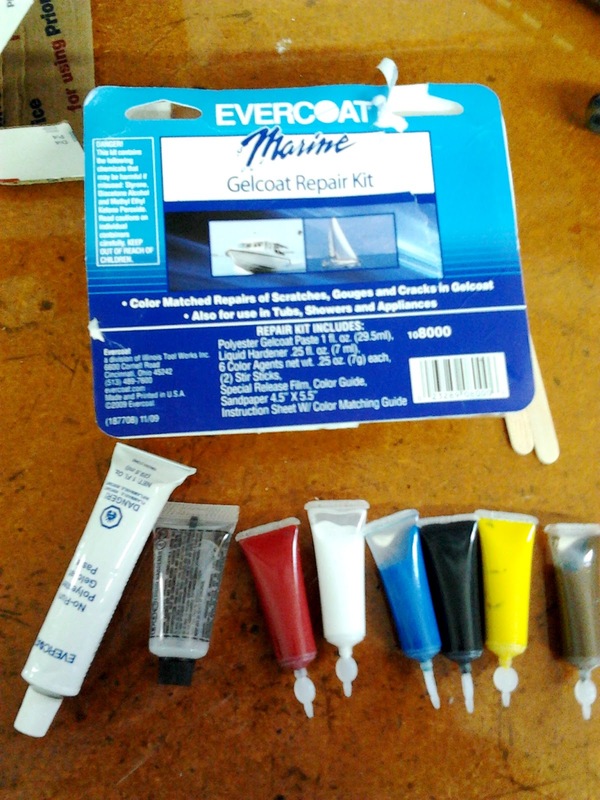 Second, you need the color tints for matching, I bought a kit from EverCoat that contained all the tints and a polyester patching product (that I'm not using). 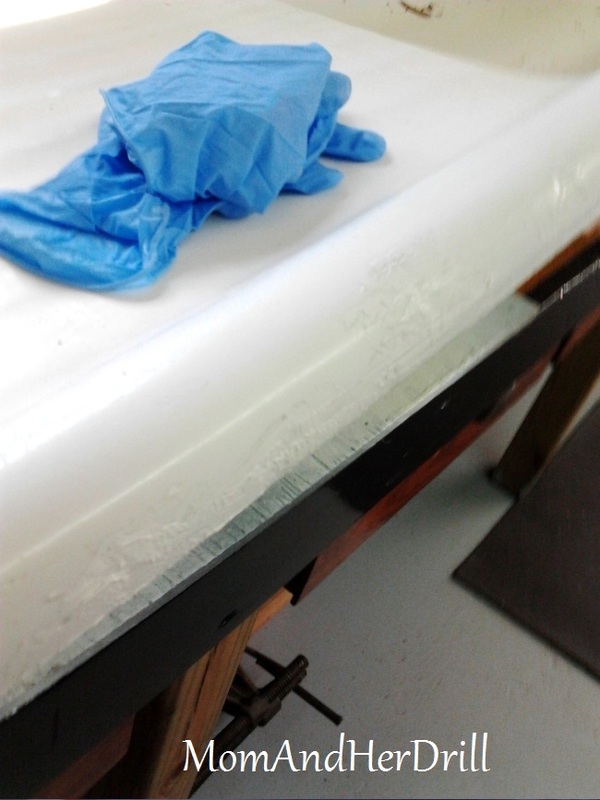 You could use it, but a 2-part epoxy resin system like Marine Tex is the hardest possible material. First mix up the color: for an off-white porcelain I used a touch of brown, black, and yellow tints. Then I put a little dab on my putty and mixed it in. I kept messing with the tint until I got something I was happy with. Then I applied it to the chips in the porcelain. Make sure the surface is clean and dry before application, and then smooth it the best you can. 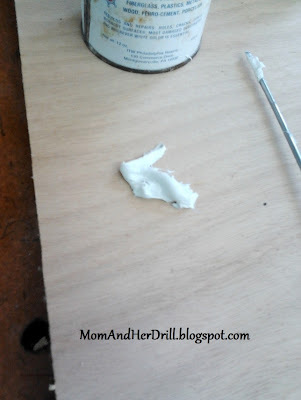 Afterward you'll have to wet sand this to get it perfectly smooth, since this epoxy resin dries as hard as glass! Note: this is the reason I won't use those bathtub refinishing services. 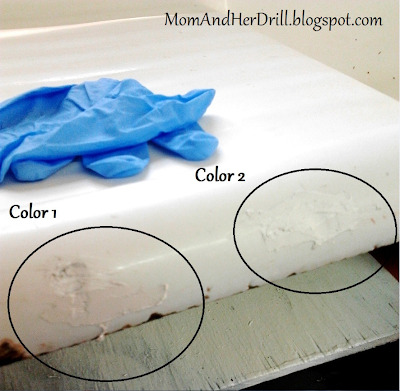 Those are epoxy paint coatings. They are not going to stick as hard as a 2-part epoxy resin mix. They will wear, and if you've painted an old cast iron/porcelain pink bathtub with white spray coating, the pink will show through eventually. Awesome, awesome info!!! When I renovate, I try to salvage as much as I possibly can, so this is great to know! Katy it's looking beautiful, amazing what a little love and patience can do for something so neglected. On to Mr. Shopsmith - good luck! You are as creative and smart as they come! Great job! This right here is why I love the internet. (Well, that and cat pictures.) Not being a boater I would never know these products were out there and would work for this application. Thanks for working this out and sharing it with the masses! 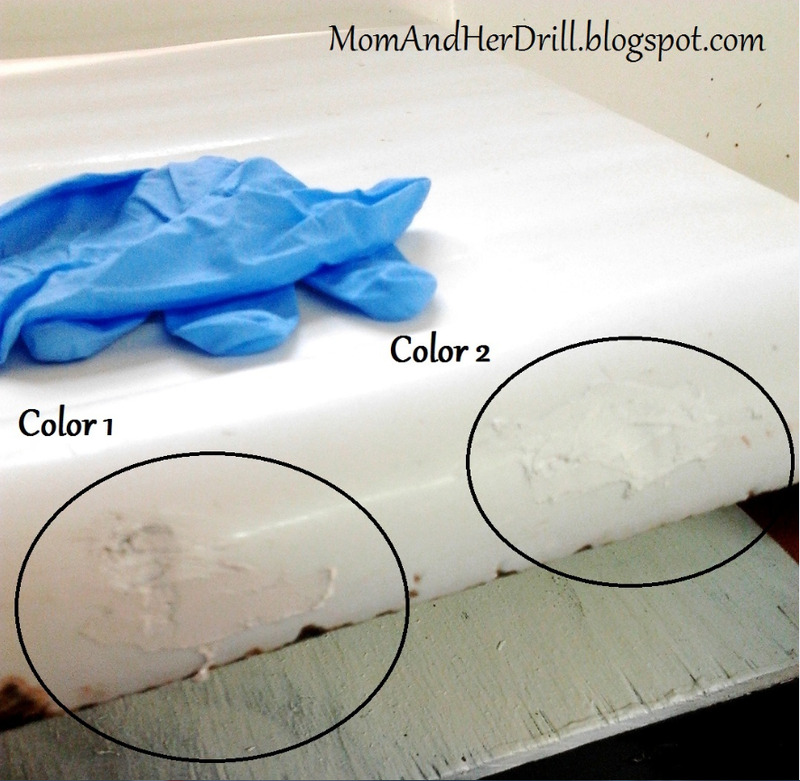 How do you think this would work on a tub that's already been resurfaced (i.e., "painted") and the new surface is chipping/peeling off? You can't put this over top of the paint coating, because the paint coating is coming off. WOW, so glad I found you on Pinterest! You and your Dad are awesome! And generous, so grateful you shared this! I've been wanting a sink with drainboards (like I had oh-so-many-years-ago and thought I should have stainless steel instead, LMAO!). Well, I haven't found one that wasn't stupid expensive - and voila, the house we just bought has a wonderfully deep porcelain sink! No drainboard, but free is free. Believe it or not, someone painted it with enamel! Just filling the tubs with hot soapy water and letting it sit an hour got most of it off. The rest I plan to attack tonight after work. :) Now I'm very excited to try both your suggestions to end up with a beautiful AND deep sink! Thanks again! P.S. Looking forward to exploring your entire blog, looks like a great one! Thanks a bunch for your all your research and hard work figuring this out! I have one of those clawfoot tubs that was "coated". 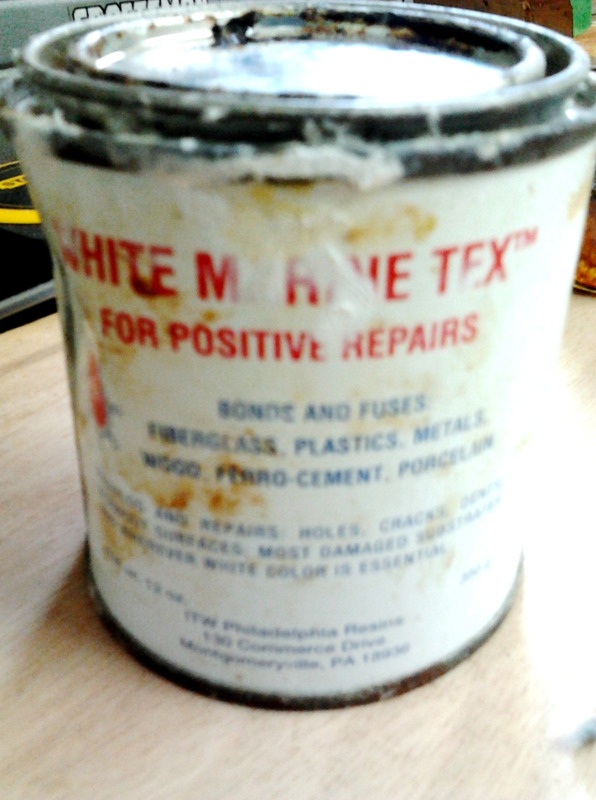 The entire bottom is a mess of gaps where the coating came off and rusting original porcelain. 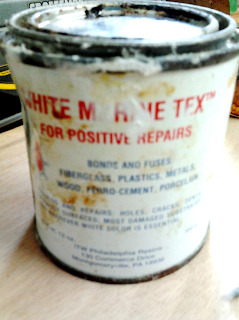 I'm going to experiment a bit with some of the products you recommended and see what kind of a restoration I can come up with. 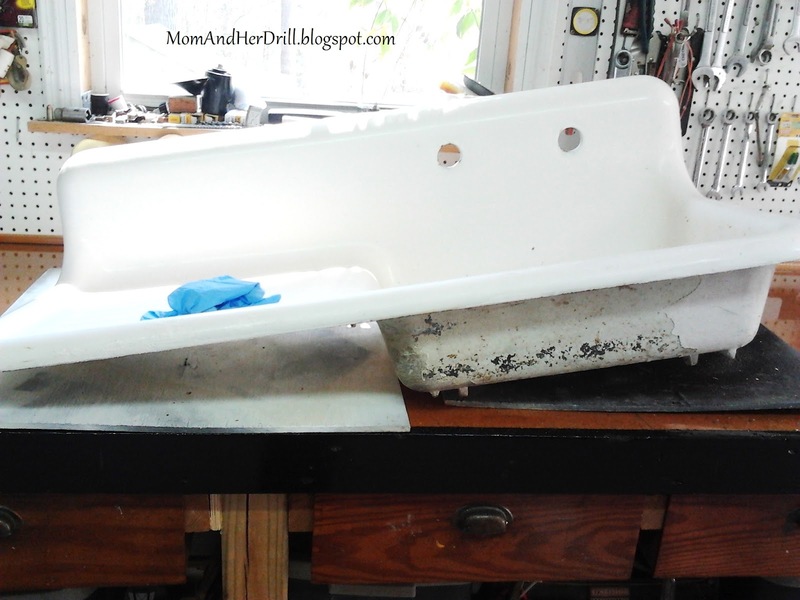 Also good tips for the vintage kitchen sink in my future! Thank you for the wonderful ideas! I believe sometimes the best man for the job is a "woman" and I enjoy attempting home improvements myself. Your encouragement and advice certainly helps! Thank you for doing this little article. We are wondering what to do with the farm tub we have and this will really help. Money spent somewhere else is the best. We have what we have because of our frugal ways. People wonder but they just don't get ...you gotta save where you can. Thank you again. So I just did the toilet bowl cleaner a couple of times and it came out completely white....I cannot not tell you how many things that we tried on this old tub. With each thing, it would get a little better, but nothing got it 100 percent. So happy that you posted this...thank you! Thanks so much for this -- I have a 1929 original sink, much beloved and original to our home, and have been lamenting what to do with it and where the finish has come off near the (new) drain and a couple of old water drip ditches. 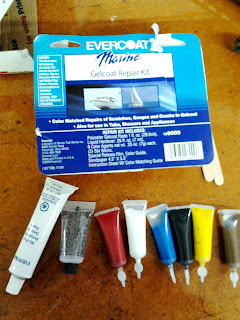 Quick question -- did you apply any shiny gloss finish once you finished with the Marine Tex? Or did the acid bring up a similar shine to the original? 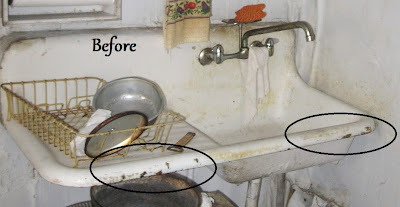 btw -- white vinegar straight up and rubbed into the sink will bring back a good shine, too! Question....I am little confused did you put the gel on first and then the hardner? Or vise versa? This is wonderful. I chipped my tub when I was remodeling the bathroom. Thank you kindly for your reply. 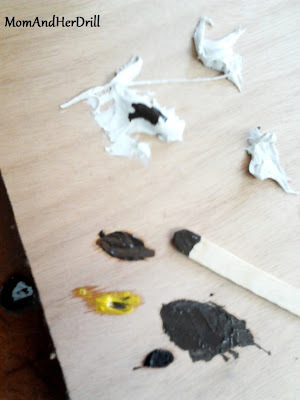 you mix the color with the putty first. 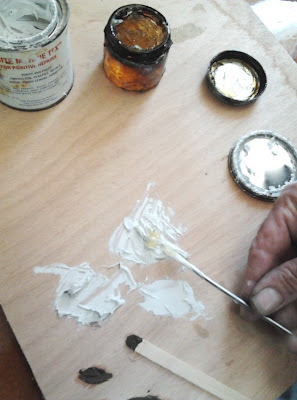 Then you have to mix the putty and the hardener together in order for the chemical reaction to start. Once you mix them together you have to quickly start applying it to the surface. Hi Katy. We just bought an old drain board sink. Was wondering how your method has held up over the past few years? Any 20/20 advice? Great job! This is wonderful advice! Thank you so much Just recently purchased a porcelian sink with drainboards and any advice on repairing chips is greatly appreciated! Just wondering on how the sink is holding up? Is its lasting as long as you hoped? hi Katy I was wondering what grade sand paper did you use and did you use a pad or electric sander to get it smooth. Hey Robert, nice to hear from you! :) do not use an electric sander on this, I did it by hand and used fine grit. Hi Katy, what would you suggest as to keeping the acid from going down the drain in an old kitchen sink that is being used? Thanks for a reply.